Inksters Supports Barnardo’s During Remember A Charity Week. 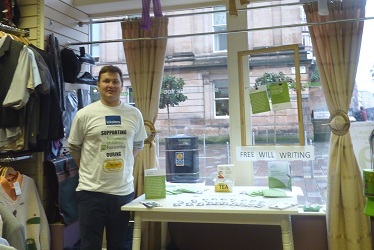 Inksters staff have been in the Barnardo's shop on Wilson Street in Glasgow this week promoting the charity’s Free Will writing service as part of the UK’s largest joint charity campaign, Remember A Charity Week, 12 – 18 September. Celebrating its third year, the Remember A Charity week sees over 140 charities from around the country coming together to highlight the importance of gifts left to charities in Wills. Inkster’s Iain Witheyman will be in the Barnardo’s Wilson Street store throughout the week to offer free and impartial information about making a Will and offering the chance to participate in the Barnardo's Free Will Scheme. The Barnardo's Free Will Scheme is open to all UK residents aged over 55. By offering a Free Will service, Inksters and Barnardo’s hope that people will remember the charity in their Will, but there is no obligation to do so. Dylan Carroll who manages the Barnardo’s Free Will Scheme, said: “Almost half of Barnardo’s income from the general public is donated through Wills and the money raised is vital to help Barnardo’s continue its work with deprived children. If you would like Inksters to write your Will (perhaps its your first ever Will or as a update of a previous Will) under the Barnardo’s Free Will Scheme then please call us on 0141 229 0880 or email us and one of our team will be happy to talk you through all your options, such as how to leave a donation to a worthy cause like Barnardo’s.